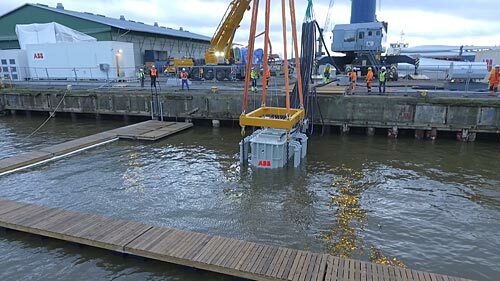 The first full scale prototype of a subsea variable speed drive (VSD) has been successfully tested in a sheltered harbour in Vaasa, Finland, taking the vision of an all-electric subsea processing facility one step closer to reality. A variable speed drive is needed to boost the productivity of oil and gas processes and improve energy efficiency, while providing the highest reliability. The test is the latest in a 5-year Joint Industry Project (JIP), started in 2013, between Statoil, Total, Chevron and ABB. The JIP aims to develop transmission, distribution and power conversion systems for subsea pumps and gas compressors, operating at depths of 3,000 metres and over vast distances. By providing the large power needs closer to the reservoir, production improves due to the increased flow and pressure of the stream. The subsea variable speed drive, designed for subsea gas compression, was operated, over three weeks in November 2017, in a back-to-back configuration directly with the grid, without motor loads. This so-called “power-in-the loop” test, means that only a few hundred kilowatts of losses need to be supplied from the grid. The subsea VSD features a pressure compensated design, whereby all of its power components are cooled by being submerged in oil. The water test proved that the electronic and power components can meet the thermal performance demanded. Prior to the test, the main drive sub-assemblies and components were pressure tested at 300 bars in Statoil’s R&D facility in Trondheim, this test performed to demonstrate that the drive can tolerate a pressurised environment. “This is a major milestone in solving such a grand challenge. It takes technology from the laboratory to the field in a structured qualification and pragmatic process, via prototypes and multiple demonstrations,” says Bazmi Husain. Taking power distribution from onshore to the sea bed, with up to 100 MW capacity being transmitted some 600 km, frees up the limited space on topside installations. Costs are reduced by having one cable that is distributed to many subsea loads. Furthermore, operational costs are greatly reduced, energy and CO2 emissions are lowered, while marine pollution is cut and decommissioning simplified. A highly complex system in such an extreme environment must be reliable and designed for long life with minimum, if any, intervention for maintenance or repair. “We have to prove to our customers that the entire installation is going to be ultra-reliable because pulling up equipment from 3,000 metres costs a lot of money,” explains Per Erik Holsten, managing director of ABB’s Oil, Gas and Chemicals business. This team is pushing the boundaries of traditional product development, specifically to attain the highest possible reliability. In addition, to ensure a cost competitive subsea processing facility, the installation needs to be low weight and small to enable simplified logistics. Following the success of the test, the JIP is now preparing for a 3,000-hour shallow water test of a subsea power system with two variable speed drives in a parallel, combined with subsea switchgear and controls, targeted to start late 2018. The first installation of the new subsea power systems in offshore production sites are expected to begin in 2020. “While these technology developments and the project progress relies heavily on experience, know-how and an ability to deliver, the critical element is the collaboration between all joint industry project members. It is enhanced by regular and deep partner involvement which operates at multiple levels,” explains Per Erik.